Christmas in Cape Town. Whether you visit the Mother City during this holiday season or live in Cape Town, this is a real special time to many people. The majority of Cape Town's population is Christian, so you will find that many Christians traditions are observed in South Africa's Mother City. Whether you want to know what to do over the Christmas holidays in Cape Town or which shops or facilities will be open and which not, you will find many answers to the most frequent asked questions we get asked here. Also you will find below interesting facts and tips for Christmas in Cape Town 2018. Like in many parts of the world, the Christmas season or 'Advent' is celebrated with visits to family and friends over the festive season, Christmas parties and Christmas dinners and naturally the Christians will celebrate Christmas Day with Christmas mass at church, visits to friends and families homes and gift giving. 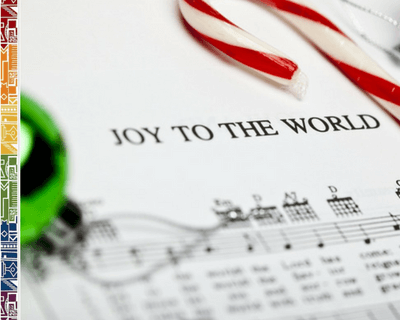 Cape Town’s Christians visit the churches on 24 December for a midnight mass and on 25 December when there are often special mass and choir concerts at Christmas in Cape Town. Christmas is celebrated by most of the Capetonians, as almost 80% of the population in Cape Town are belong to various Christian faith groups. Most of the Mother City's christians belong to Dutch Reformed churches, Apostolic churches and Pentecostal or charismatic churches, Anglican, Methodist or Catholic churches. Most of the Capetonian Christians are very religious and these holidays are celebrated with lots of joy and sharing. The Festive Season starts usually in Cape Town with a huge free concert in the Cape Town city centre at the beginning of December. Remember there is another public holiday in December, then all offices are closed. 16 December 2018 is Reconciliation Day, but falls on a Sunday, thus on Monday will be held a public holiday. When you celebrate Christmas in Cape Town, you will also experience a festive atmosphere here. Starting with Christmas Eve, Monday 24 December, many Cape Malay music bands roam the streets in the city centre entertaining visitors and locals, also with popular carols. Tuesday, 25.12. (Christmas Day) and Wednesday, 26.12. (Day of Goodwill) are public holidays. Cape Town Festive Season will start on 2 December 2018 with the official switch-on of the Christmas lights. The entertainment on the Grand Parade will start in the afternoon from 16h00 and the official opening of the festival with the switch-on of the Christmas lights is expected to take place at 20h30. The spectacle will include laser displays and fireworks. Dubbed as largest free open-air public event, some of South Africa's top entertainers such Dr Victor & The Rasta Rebels, Shekhinah and Emo Adams will be part of the vibrant street party this year. So this is certainly one event not to miss if you are in town. Make sure u also visit the Cape Town summer market which is attracting locals and visitors to the Company Gardens during December 2018. 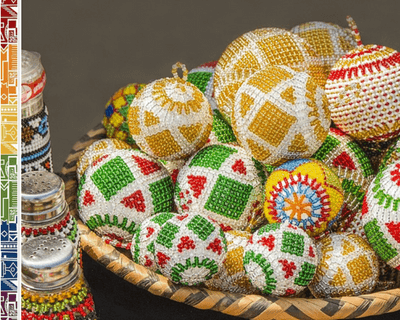 Lots of small stalls where you might find some lovely gifts and local arts and crafts such as beaded necklaces, scarves, pottery or woodworks. So come and visit and support the locals. Also some tasty local treats for sale! We have found a wonderful special treat for you when you are in Cape Town. Plan to go to one of the wonderful outdoors Carols by Candlelight Concerts in Cape Town when you stay in the Mother City. Listening to splendid orchestras or choirs as well as singing along popular festive tunes while overlooking the stunning beaches, the lush winelands or enjoying the calmness of a church will set you in the festive mood at once. The V&A Waterfront as one of the main attractions in Cape Town is decorated beautifully and free concerts at the amphitheatre at held regularly. 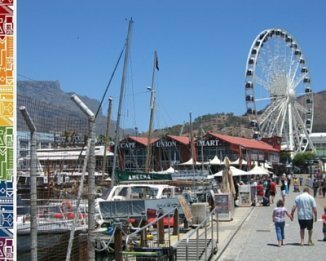 There is also the huge Ferris Wheel which is great to go on at day or night to have a stunning view over the harbour and the Table Mountain. Many main streets, like Adderley Street in the Cape Town City Center, are illuminated beautifully at night with Christmas lights and decorations and even some house owners decorate their homes with fairy lights for the season, especially the suburbs of Bothasig and Retreat are known for pretty Christmas decorations on private residences. There are the numerous little Christmas markets in the Mother City which you could visit with your family and friends, so explore them and meet the friendly locals and enjoy the great atmosphere at the Cape Town christmas markets. Read our special pages on markets and concerts. Christmas in Cape Town 2018: Christmas Day is Tuesday, the 25 December, which is a public holiday as is in many parts of the world. Many shops will be closed on this day. However, major malls will be operating on restricted opening hours, this will apply also to major food stores. Wednesday, 26 December, is celebrated as Family Day or Boxing Day, which is a public holiday and referred to as 'Day of Goodwill' in South Africa. Most shops will be open for business on this day, especially those in tourist centres and in major shopping mall or the big supermarkets. Christmas Day is celebrated by many Capetonians with friends and family and often families gather for a typical South African braai or more traditional Christmas dinner. So should you be invited to a Christmas party, you can dress casually and lightly as the temperatures usually are hot at this time of the year. Often you will be even asked to bring your swimwear as many locals enjoy the luxury their own pool in the garden. So bring a little gift like good wine, delicious chocolates or some flowers. 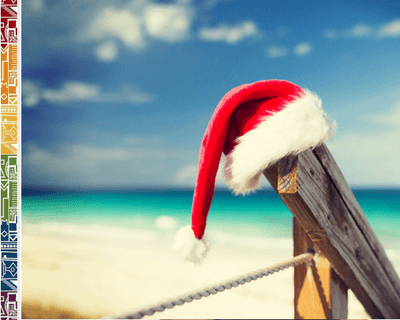 Christmas is often also spent on the numerous stunning beaches in and around the Mother City. So find a nice spot where you can enjoy your Christmas with a little picnic and relax in the sunshine and listen to the waves... But remember: Do not take alcohol to the beach as it is considered an offence to take your alcoholic drink to the beach. 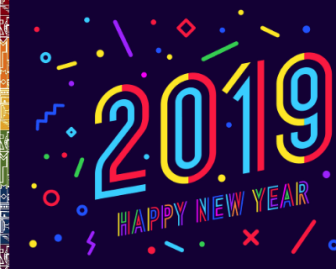 Last but not least, shopping... As mentioned above many shops in Cape Town will be closed on the 25th, but some super- and hypermarkets will be open, albeit at restricted opening times, most shops will re-open on the 26th of December, Day of Goodwill. It is possible to do limited grocery shopping during the public holidays, however the opening hours will be slightly shorter, Woolworths or PicknPay for example usually open from 9h00 - 17h00 on Christmas Day. And as everywhere in the world you will notice the usual mad run and rush the days before Christmas at Cape Town's shopping centers. So be prepared and come early as parking often is tricky to find during the weekends and days leading up to Christmas. Need a special Christmas gift? For the traveller, insider, expat... or of course the loved ones 'back at home' so they understand better! Order directly with us for delivery within SA - special gift boxes available!